Ashes: The Gathering | SPACE-BIFF! Setting up a victory without even having to fight. In so many ways, Ashes feels like someone took Magic: The Gathering down from a high shelf, beat it like a dirty blanket, shook out the moths, put colorful patches over the threadbare bits, and started snuggling with it again. I’m sure there’s somebody out there that will feel frustrated with me for saying so, somebody who knows the name and favorite breakfast food of every planeswalker or who lovingly arranged spreadsheets of Ashes’ extensive lore, but even in terms of story they’re functionally identical. You’ve got a super-wizard to protect, an enemy super-wizard to defeat, and a whole lot of units and spells to make it happen. This isn’t Netrunner, Doomtown: Reloaded, or even Conquest. It isn’t trying to stagger us with its uniqueness. Instead, it hopes to dazzle with its coolness. And it’s very, very cool. Its greatest accomplishment — and we’ll talk more about its technical side in a minute — is that everything in the box, from units to accumulated spellbooks and terrifying reactions, feels weighty. This base set comes with six pre-assembled decks, and each of them hits hard in their own way. In Ashes, there’s no such thing as a “baseline” deck, nothing stuck in the middle of the road, no vanilla. The deck that starts out like it’s doing your average swarm-of-wimps thing then hands you spells like Root Armor and Massive Growth, and staffs your hordes with Butterfly Monks who get stronger in numbers. Suddenly, you’ve got a swarm of WHAT THE HELL barreling across the board to slap your nemesis silly. And that’s just one of six pre-built factions. There’s the guy who summons powerful units for cheap, with the caveat that they’re illusions and get dispelled upon suffering so much as a scratch. Then he casts Bring Forth, and those illusions get even stronger and stick around for good. Or the general who’s all about keeping his soldiers alive, so he outfits them with Spiked Armor and performs Chants of Revenge when they die, discouraging anyone from touching them. There’s the voodoo queen who gives special gifts to her opponents — except those gifts are worthless Blood Puppets who hurt their owner every turn unless he wastes resources getting rid of them. And the Egyptian lady who doesn’t field regular units at all, relying instead on special conjurations who get obscenely strong over time. To prevent them from being killed off before they’re ready for an unblockable attack, she’s armed to the teeth with spells that make it impossible to for her opponents to do much of anything on their turn. Man. I could keep going. There’s just so much cool stuff going on here. Ashes: Rise of the Decadent Dandies. One of the biggest departures from the Magic: The Gathering formula is the absence of resource cards. Rather than taking up space in a deck, resources are handled by rolling dice. Each side gets ten, rolls them at the start of the round, and is given a bunch of tools to manipulate their outcomes in the event they don’t get enough of what they want. There are four flavors of dice, each bestowing unique powers like fishing dead soldiers out of your discard or drain their own supply of dice, and the riddle of how to best spend them makes up quite a bit of the gameplay. Of course, one could imagine any number of complaints about this system. A bad roll can severely disrupt your strategy, though Ashes is aware of this and gives you plenty of ways to mitigate a flub. You can, for example, use the “meditate” action, which lets you discard cards to switch your dice to whichever face you prefer. This might sound like a waste, but ensuring a steady stream of powerful resources is often a higher priority than using every single card that enters your hand, and most of my matches have seen both players making two or three careful uses of this option. Perhaps more damning, this system sacrifices Magic’s sense of growth. Your Phoenixborn strides onto the field with ten dice. When the smoke clears, you’ll still have ten dice. Then again, I’m not about to defend Magic’s resource system, and in practice one of the best things about Ashes is its sense of flow, so I’m offering this more as a statement about potential complaints than about one of my own. Speaking of flow, Ashes is fantastic at it. Turns alternate quickly, only letting each player do one or two things before their opponent gets a chance. It isn’t possible to summon a monster, give him armor, cast a boosting spell, and attack all in one go. You’ve got time to do one of those things, maybe two, then the turn flips and you get to wring your hands and wonder how your nemesis is going to wreck the plot you’ve set in motion. It plays fast, relentless even, and encourages constant participation. Ashes isn’t the sort of game you’ll get bored with, is what I’m saying. Ashes is nothing if not photogenic. And yet, despite being one of the best games I’ve played this year, Ashes leaves me just a tiny bit worried. Not in game terms — truly, it’s enormously fun, very clever, and feels like a version of Magic that I could actually stand to engage with over the long haul. The starter box is jam-packed with great stuff and stands on its own as a fantastic card game, and I wholeheartedly recommend it. Even so, this game’s success will come down to the level of support Plaid Hat can offer it. If it gets consistent releases, and if Plaid Hat show a willingness to fix problems as they crop up, then it has a chance of thriving. If not… well. That would be a pity. As for replacing Magic, Ashes doesn’t stand a chance, though that’s only because no one does. But for the rest of us, this is a fast-paced, ultra-smart wizard duel that takes a tired formula and makes it fresher than a pine forest in winter. Give it a shot. Posted on October 30, 2015, in Board Game and tagged Ashes: Rise of the Phoenixborn, Board Games, GenCon Loot, Plaid Hat Games. Bookmark the permalink. 6 Comments. Would you say you like this game more than Summoner Wars? All this gushing makes it seem that way! That’s a tough question, largely because my appreciation for Summoner Wars has grown with its metagame. It was one of the first games I bothered purchasing an expansion for, and I looked forward to each new release, so it’s fair to say we have a history. The problem with SW, however, was that it was slightly broken from the outset, with two overpowered initial factions that were never quite brought to heel. Those, and some later additions, were a slog to duel, and they had a diminishing effect whenever they appeared on the table. I’m convinced (though I could be wrong) that Ashes is off to a better start, but its longevity will depend on whether it’s fully supported by Plaid Hat and — crucially — whether it receives proper adjustment to over- or underpowered cards, combos, or Phoenixborn in the future. Plaid Hat stated early on for Summoner Wars that it wasn’t going to make any adjustments to existing factions (and in fairness they were a small company and didn’t want to split their player base), but a tweak to two or three sets might have fixed innumerable problems down the line. With Ashes, they have the benefit of learned experience. This box is already more interesting than the original SW sets, and I hope they’ve learned how to give their games the support they need to thrive. So my short answer to your question is yes, I like this a little bit better than Summoner Wars, but mostly in SW’s early form. The SW that eventually included second summoners and Alliances still holds a special place in my heart. Ask me again in a couple years and I’ll have a more comprehensive answer for you! I largely agree with Dan on this one. 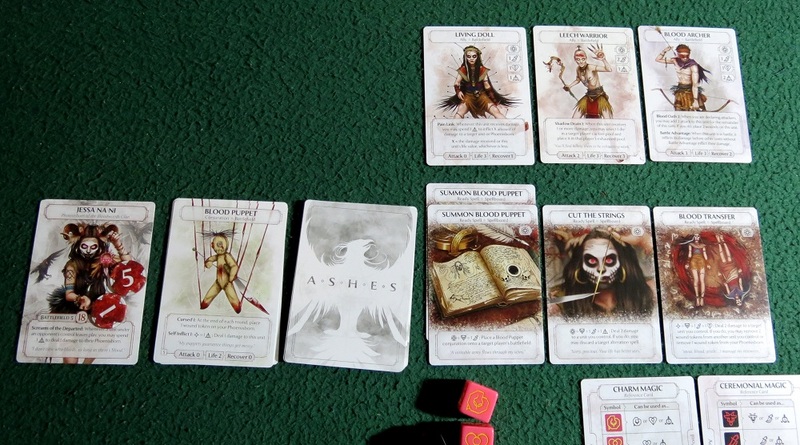 Ashes feels polished the way later Summoner Wars sets felt polished. Until Ashes is expanded I still prefer my SW, but give Ashes a year or two and who knows how good it will be? Hm. I’m not so sure on Ashes. I felt it lacks uniqueness. It just felt mostly derivative of Magic, without having special/unique quirks. 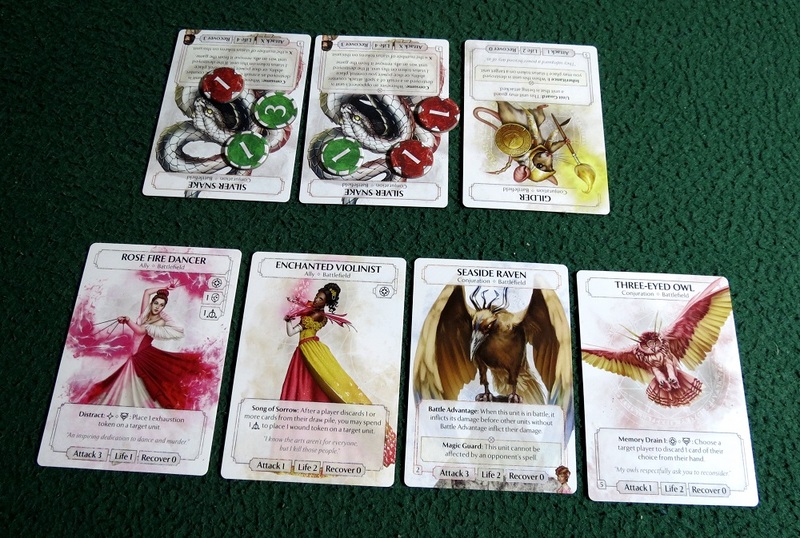 That damage was permanent also added to a fiddly feel, as did the overlapping cards (spellbooks). Yeah, those spell-books might have been the quirky part.. but I was underwhelmed with having to summon the same creatures all the time. Just more of them, or cheaper. Yes, Ashes fixed some of the resource problems in Magic, but that said, it also introduced their own with the dice system. Yes, “meditate” is a way to counter-act bad rolls, but they still cost resources and a quick action taking the place of something you’d have rather done. In that respect I feel a game like VS 2PCG does it even better. Just generic resources unless you want to use the special abilities of your “lands”. All in all, I felt Ashes was disappointing. It was too close to Magic without being clearly better. It was merely (almost) as good as. As such, I do think FFGs LCGs do that better. They are “more” different, while being solid card games in their own rights. I think I would’ve liked Ashes better if they had departed the summoner vs. summoner model and had gone for something like SW:LCG, Netrunner or even Conquest.